Re4f region has well separated spin-orbit components (Δmetal=2.43eV). Broad loss feature for Re metal appears at ~53eV. Peaks in the Re4f region have an asymmetric peak shape for rhenium metal. 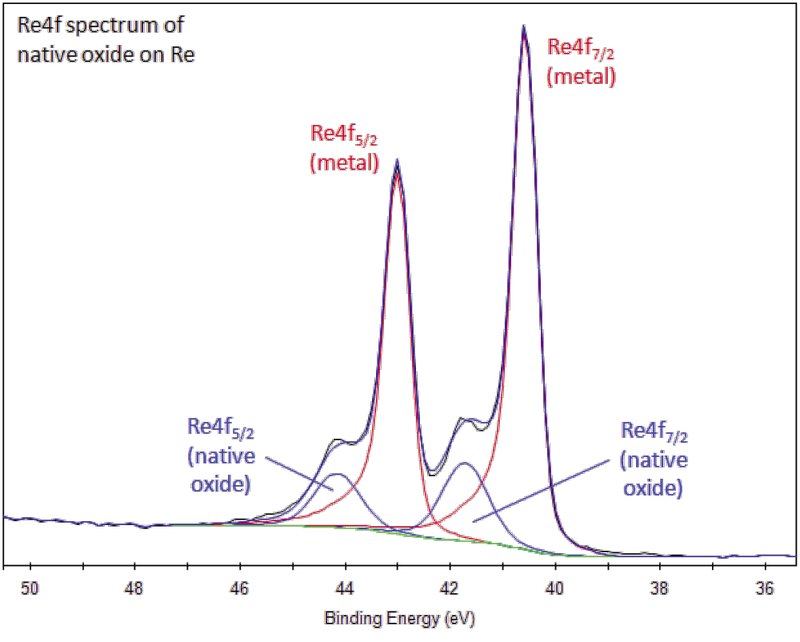 Rhenium compounds, such as the oxide, have symmetric Re4f peaks. Rhenium, a silver, lustrous metal, has one of the highest melting points of all elements, with only tungsten and platinum being higher. Trace amounts of the element rhenium were discovered spectro- scopically in platinum ores in the minerals columbite, gadolinite, molybdenite and in platinum ores by the German chemists I. Tacke-Noddack, W. Noddack and O. C. Berg in 1925. The element is commercially used in a powder form; however, rhenium can be solidified by pressing or resistance-sintering in a vacuum or hydrogen atmosphere, creating a contact shape. Rhenium is most often used in platinum- rhenium catalysts to make lead-free, high-octane gasoline and to make jet engine parts. The element is also used in flash lamps for photography and for fila- ments in mass spectrographs. 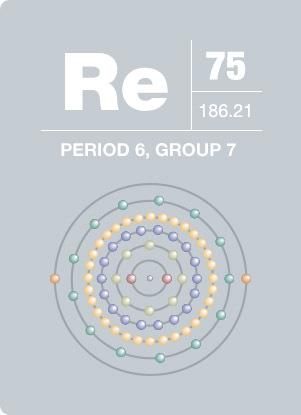 Rhenium was the last naturally-occurring element to be discovered to date.